Flood warnings and flash flood warnings are in effect throughout the region Thursday evening as Tropical Storm Michael continues moving north. Several counties in Virginia are under a flood warning until 3:15 a.m. including parts of Fairfax, Culpeper, Stafford, Prince William and Spotsylvania counties. Prince George's and Charles counties in Maryland are under flood warnings until 2 a.m.
Hurricane Michael slammed into the Florida Panhandle Wednesday afternoon, splintering homes and submerging neighborhoods before weakening to a tropical storm overnight. The storm is moving through the Carolinas and is expected in southern and central Virginia next. Southeastern Virginia could see as much as 6 inches of rain. 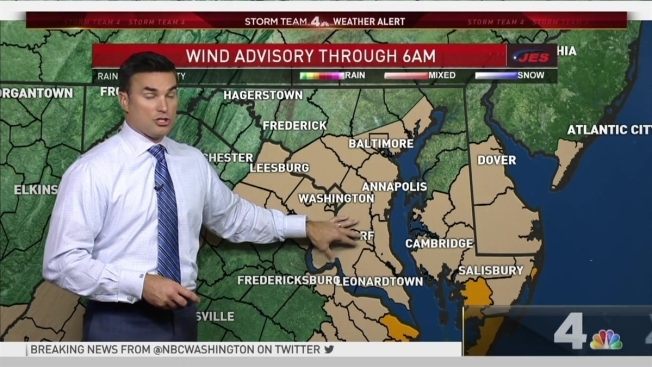 In the D.C. area, scattered showers with patches of heavy rain fell Thursday afternoon and into the evening. Flash floods hit parts of Culpeper and Spotsylvania counties earlier in the evening. Gov. Ralph Northam said he issued the state of emergency order to mobilize resources and help residents avoid damage. "As Tropical Storm Michael turns to the Commonwealth, I want to urge all Virginians to prepare for the serious possibility of flash floods, tropical storm force winds, tornadoes, and power outages,” he said in a statement. A cold front is likely to drop temperatures into the 60s Friday. This weekend is looking more like fall, with highs in the 60s and lows in the 40s and 50s.